Very little information is given online or elsewhere on installing earthen countertops. 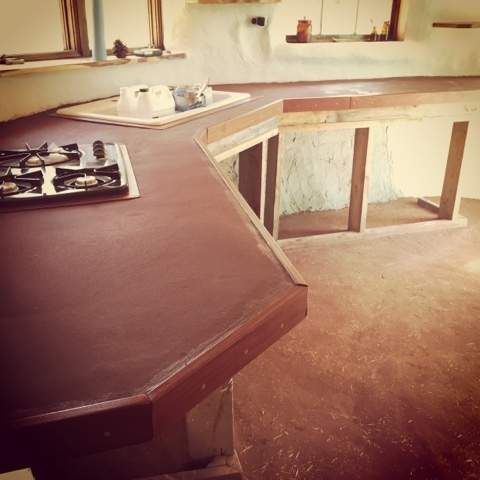 Apart from the actual walls of our house being made of sand and clay, these counters are probably the most unconventional feature of our house. Despite the numerous frowns, raised eyebrows, and quizzical stares from people I've told about our decision for counters made of earth, I can assure you that after 7 coats of oil and a nice buffing of wax, they will last a lifetime. How are these counters holding up? What have you done to maintain them? I'm building a tiny house in MA, frame on pilings, but with a beam roof and part sod. I'm looking to use wood and cob inside walls. (Siding it now so this is a little ahead of myself!) I love your cob counters. Can you give me your formula? Thanks for the inspiration! Hello, thanks for your questions. The counter were made with 4 cups powdered art clay, 4 cups water, 12 cups of very fine silica sand, 1/4 cup borax, 4 cups of wheat paste, and the fluff from 2 cattails. This was all blended together for a really dry cob mix. We still got hairline cracks in our counters, not a lot but a few so I might do more sand and more fibers. As I always suggest, make a ton of samples to get the perfect mix for you. You are never going to have the exact same materials anyone else has used so that is really important. The counters were finished with multiple coats of tung oil and a liquid wax after. They hold up amazing! Super hard and really difficult to gouge not that i've tried, but i have dropped pots and pans on them without damage. Just as easy to clean as any other counter. If you spill water and leave it too long it will soften the wax and make the counters turn whitish. I thought this was a big issue at first, but as the water dried they went back to normal. What did you use underneath to support the cob? We used 1" chipboard as someone gave it to us for free. It was quite heavy duty and the earth material for the counters was only a few inches thick so the weight wasn't a problem. Did you adhere the counter to plywood? How? Whats the benefot of tung oil over something like boiled linseed oil? Yes, the counter material adhered to the plywood. However, for extra grip I tacked in nails all over the board to give better grip to the earthen material. Tung oil is a harder drying oil and therefore is more resistant to water than linseed oil. It is also much more expensive which is why we didn't only use the tung oil. We used boiled linseed oil for the first few coats of oil at full strength. "boiled" has added chemicals for drying agents and so it has a chemical smell. Tung oil can be cut with citrus solvent to get better penetration. The clay we used was red art clay from Archie Bray in Helena Montana. You can get red art from any clay studio or supplier. You could also use any "ball" clay that you can find or natural clay in your soil. We mixed the clay with fine silica sand and cattail fluff for fiber. Experiment with small samples of whatever you can get so you know it will work before putting down a large counter top. The finer the aggregate and the more compression you apply, the harder the finished product. Also, oiled earthen counters are similar to oiled concrete in that oil should be applied each year to keep the surface water resistant. Good luck on your project!